Japanese Prime Minister offered a Yen 38 billion ODA loan to Sri Lanka for water purification projects for Kidney diseases and establishment of electricity transmission lines connecting the entire country. Prime Minister Abe thanks President Sirisena for raising Asia’s voice and explaining the Asian perspective to the Western nations at the G 7 Outreach Summit in Ise Shima in Japan. Sri Lanka Summit Meeting May 28, 2016 On May 28, 2016, H.E. Mr. Shinzo Abe, Prime Minister of Japan and H.E. Mr. Maithripala Sirisena, President of the Democratic Socialist Republic of Sri Lanka, held a bilateral summit meeting in Nagoya, Japan, following the Outreach Meeting during the G7 Ise-Shima Summit. Both leaders shared the view, considering the fact Sri Lanka is strategically located in the Indian Ocean, that the development of the country and strengthening regional connectivity are of critical importance to the prosperity of the entire region. Both leaders reaffirmed that they would strengthen cooperation for the implementation of the Comprehensive Partnership between Japan and Sri Lanka and the Partnership for Quality Infrastructure. Prime Minister Abe expressed his intention to provide ODA loans, which amount to approximately 38 billion yen, for the construction of transmission lines in the North Central and Eastern Provinces and water supply facilities in the North Central Province, in order to further promote socio-economic development of Sri Lanka. The project of constructing transmission lines will allow the electricity generated at the power plants that Sri Lanka planned in the Eastern Province to be transmitted to the City of Colombo. Desiring to contribute to national development efforts in Sri Lanka, Prime Minister Abe expressed his intention to positively consider the provision of Development Policy Loan (DPL), which supports policy and institutional reform in macro-economic and public financial management, as well as the promotion of the private sector. Both leaders recognized the importance of port development in Sri Lanka, as a key hub nation in the Indian Ocean given the rising demand and the rapid growth of the region. President Sirisena expressed his appreciation for the Japanese assistance provided thus far in this respect. Prime Minister Abe stated that Japan would actively continue its cooperation on the development of the Colombo port and its vicinity under the public and private sector cooperation. Prime Minister Abe also expressed his intention to send survey missions to study the needs and the logistics for hub development of the north port of Colombo and its surrounding areas, as well as the development of the port of Trincomalee. Prime Minister Abe conveyed Japan’s decision to extend assistance for the development of a master plan of the City of Kandy, which would enable the urban development needs of the ancient city with appropriate consideration for the protection of the cultural heritage. Prime Minister Abe further expressed his intention to send a study mission. President Sirisena expressed his appreciation for the Japanese assistance. Both leaders welcomed Sri Lanka’s decision to adopt the Japanese system of Digital Terrestrial Television Broadcasting (DTTB) and the progress of bilateral work to ensure a smooth transition to the DTTB Japanese system, including the establishment of a bilateral Joint Committee to facilitate implementation of the project and holding the first meeting of the committee in June. President Sirisena stated that the implementation of Digitalization of Terrestrial Analogue Television has been assigned to the Ministry of Parliamentary Reforms and Mass Media. Both leaders welcomed the convening of the first round of the Policy Dialogue at the Senior Official Level of the two Foreign Ministries and the inaugural Sri Lanka-Japan Dialogue on Maritime Security, Safety and Oceanic Issues in January 2016 in Colombo, where the two maritime states reconfirmed the importance of maintaining the freedom of the high seas and maritime order based on the rule of law. As a part of strengthening maritime cooperation between the two countries, both leaders also acknowledged the importance of the steady progress of the Project for Maritime Safety Capability Improvement (worth approximately 1.8 billion yen), that includes the provision of two patrol vessels. Both leaders recognized the importance of the ongoing national reconciliation process in Sri Lanka, and welcomed the exchange of notes regarding the Project for the Establishment of Research and Training Complex at the Faculty of Agriculture, University of Jaffna (worth approximately 1.7 billion yen) on 18 May, 2016. Prime Minister Abe expressed Japan’s continued support for Sri Lanka’s efforts on national reconciliation, including the contribution by Mr. Motoo Noguchi. 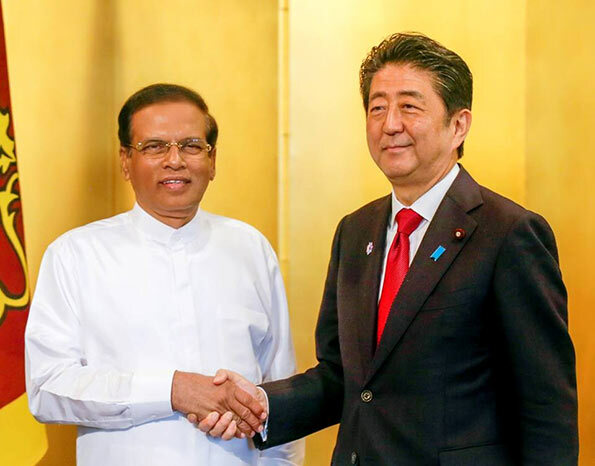 Both leaders decided to establish a Joint Committee with a view to ensure the expeditious implementation of the Joint Declaration on Comprehensive Partnership between Japan and Sri Lanka and to promote concrete cooperation in such areas as economic development, maritime security, national reconciliation and peace building. Yes Japan we need your aid to stop the starvation our meaningless over qualified folks. How can you help a another poor wounded country like Sri Lanka when you have your own financial problems. ?